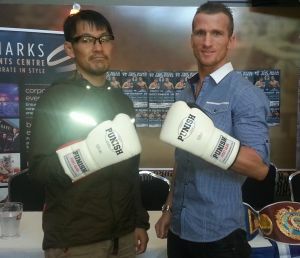 Current WBF World middleweight champion and WBO World ranked Les “Lock N Load” Sherrington today came face to face with his opponent Japanese star Shigetaka Yonezawa. 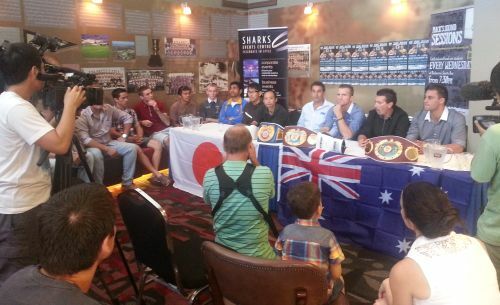 Their much anticipated bout is set to take place on September 20 at Southport sharks on the Gold Coast for the WBC Asian Boxing Council middleweight title. Also coming face to face for the first time at today’s press conference was the main undercard bout of Rohan ‘no mercy’ Murdoch and Togasilimai Letoa. Murdoch, who needs no introduction to the Gold Coast is coming of a good win against Les Piper, is excited to be back in the ring on the back of a great training camp. The September 20 card will also feature a stack of local talent. Hot prospect Rohan Murdock will take on Togasilimai Letoa. Plus excitement machines, Jack ‘The assassin’ Asis, ‘The Great White’ Brayd Smith, Darren ‘Assa Marra’ Askew, ‘Iron’ Will Young, Brett Smith, WBU World Champion Corey Mcconnel and more.